Which factors are likely to be important and dominate the EUR/USD exchange rate during the next few years? We are going to discuss fundamental and technical evidence for the most important currency pair worldwide. Our results suggest that the US Dollar is still within a secular bear trend versus the Euro. US American trade policy, as well as geopolitical trends, paint a bearish picture for the US Dollar. The Trump administration’s policies are implicitly and explicitly targeting a weak greenback. Moreover, bullish EUR/USD pressure is likely to build from Europe as a result of its geopolitical situation. Trump’s “America First” policy has two non-negligible effects on US Dollar demand. First of all, it obviously decreases the demand for foreign products and increases demand for US products. Consequently, this causes negative pressure for the US dollar. 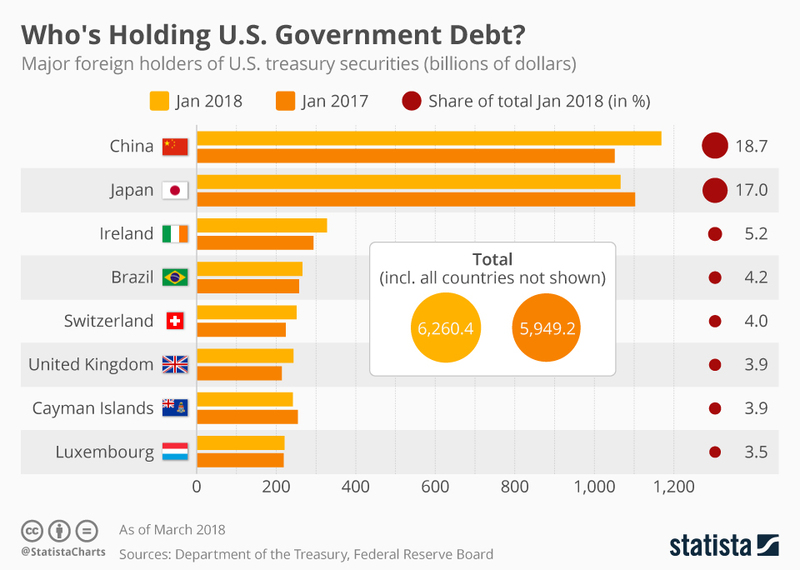 Second, some of the parties that are severely affected by US trade policy are among the biggest holders of Dollar denominated debt. They have a big interest to diversify their US dollar exposure into other currencies. This is an ongoing process already. The Chinese crude oil future market is one example of that. The recent German call for an independent international payment system is another example. Meanwhile, the US President and Treasury Secretary are doing their part to set the stage for a weaker dollar. Throughout recent history, US policymakers were at least verbally favoring a strong dollar. That’s not the case anymore. Trump and Mnuchin do not signal to have any interest in a strong US Dollar. All in all, political factors from the United States are bearish for the US dollar. The geopolitical situation in Europe adds to the case of a weaker US Dollar versus the Euro. The Brexit was the first major anti-European vote but may not be the final one. The Timbro Authoritarian Populism Index shows the average share of votes for populist parties in Europe. 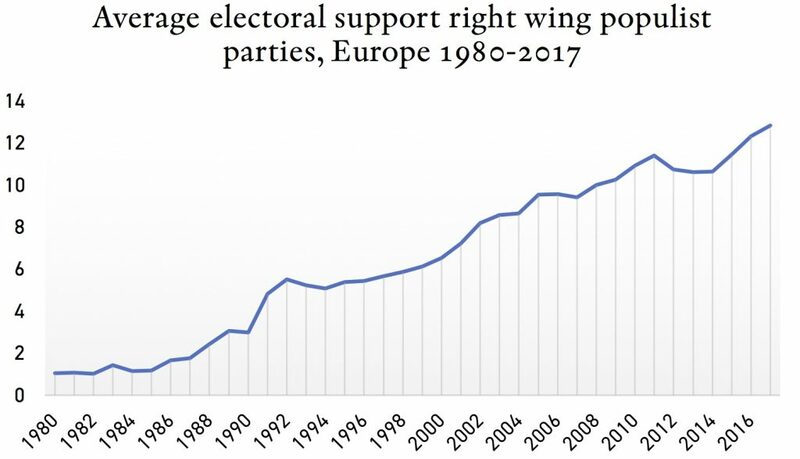 The chart suggests that Europe is within a slow but clear trend of rising populism. The opposition of a European integration is one key element that unites European populists. Hence, there is a non-negligible probability that some of the EU members will be leaving the EU in favor of their own sovereignty during the next few years. Why should that have bullish implications for the Euro? Regional data for 26 European countries suggest a positive correlation for unemployment and populist voting. Moreover, European fiscal and monetary policy as it happens today is probably inappropriate for the weakest EU economies. Countries like Greece and Italy would most likely benefit from an expansive monetary and fiscal policy. Moreover, a drachma or lira would probably float far below the Euro value improving their competitiveness. There are simply more arguments for weaker European economies to leave the Euro than for stronger ones. After all, a German exit scenario probably results in a very strong German currency. Trade barriers and a 20%-30% currency appreciation is not a favorable scenario for the export-oriented German economy. Instead, it is more likely that economically weaker Euro countries turn their back on the EU during the next few years. This, in turn, means upward pressure on the Euro. Hence, the populism trend is rather bullish for the Euro currency. The US dollar has been appreciating versus the Euro basket for the past few decades. Moreover, we do not have sufficient evidence for a reversal of this secular trend. The graph shows higher highs and higher lows over the past 40 years. As simple as it is, this is an upside trend. Moreover, we see a couple of 3-wave moves into the past couple of higher highs. That’s not a valid termination of a trend in an Elliott wave framework. It is more likely some diagonal pattern, which still unfolds. We do not have to worry about whether we are dealing with an ending or a leading diagonal at this stage. It still needs another leg to the upside before completion. Another leg implies an entire cycle of bullish Euro action. The upside leg is depicted in our Elliott wave chart. 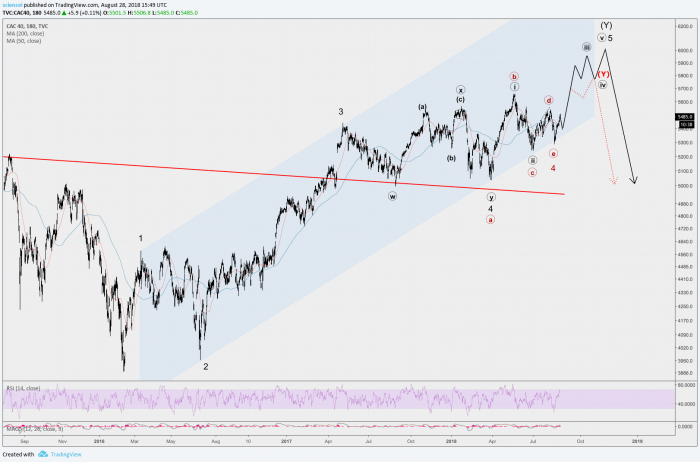 It paints a bullish EUR picture within an Elliott wave framework. 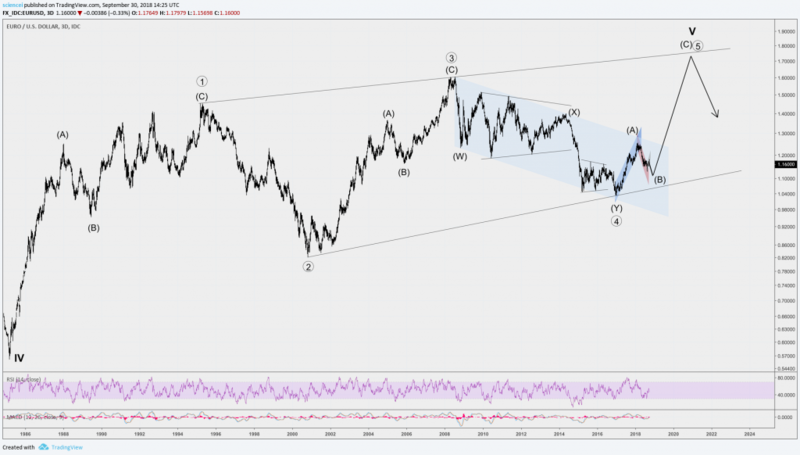 All in all, the EUR/USD is likely to unfold an A-B-C wave sequence of an intermediate degree to the upside in order to complete a paramount degree diagonal pattern. The technical outlook does not suggest that the US Dollar is depreciating from tomorrow on. As a matter of fact, the recent Dollar strength is likely to persist for another few months. However, this is subject to a shorter time-frame analysis, which is not part of our long-term case here. Fundamental and technical evidence suggests that the US Dollar is likely to depreciate versus the Euro during the next few years. Fundamentals are driven by policy and geopolitical trends on both sides of the Atlantic. The technical picture shows a secular bear market for the US Dollar. There is simply not enough evidence that this secular trend reversed within an Elliott wave framework. All in all, the US Dollar is likely to continue weakening versus the Euro during the next few years. The most recent US Dollar strength is probably just another countertrend correction.